Articles about the psoas seem to be popping up everywhere right now. The psoas is a multi-stranded muscle with attachments that begin at the last thoracic vertebra and continue along the entire lumbar spine. In a seated, computer-driven lifestyle, the psoas muscle takes a big hit, becoming weaker and shorter. The fibers of the psoas muscle dive underneath the visceral cavity and attach to the top of the inner thigh. During development, the psoas develops concurrently with the copious neural tracts (visualized in the photo to the left) of the lower thoracic and lumbar branches of the nervous system, resulting in a deep knitting together of the muscle fibers and nerve bundles that branch into the visceral cavity and down the leg. Due to this co-development, problems in the psoas can result in pain that radiates anywhere from the b ack, abdominal region, or down the entire leg. Due to the sensitive and excitable nature of the nervous system, both a shortening and an overstretching of the psoas can result in sensations of pain, as the nerves become either compressed or overstretched. This duality makes diagnosis (and, thus, treatment) of the problem tricky. People often attribute any sensation of pain to tightness in the psoas and can make the mistake of stretching an already over-extended psoas. While an overstretched psoas is definitely less common, activities such as yoga (which places a determined focus on stretching the psoas) can introduce cloudiness in diagnosing the cause of pain. Luckily, simple tests, such as the Thomas test (check it out, HERE) or the modified Thomas test, can be performed to determine the root of the problem and point the way toward appropriate, corrective measures. 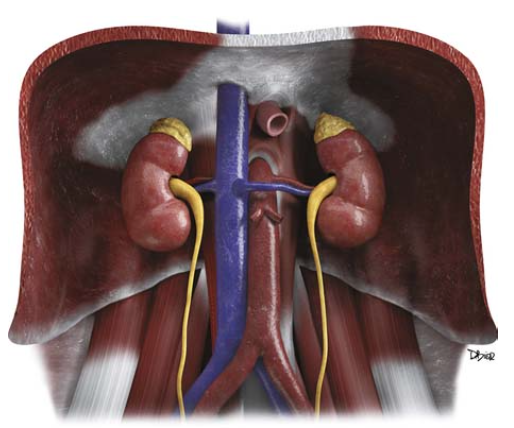 The psoas also affects the adrenal glands because the fascia surrounding the psoas is also connected to the kidneys. The adrenal glands, responsible for the release of norepinephrine and epinephrine (the chemicals that give you adrenaline and energy), sit right on top of the kidneys. Thus, any compression or overstretching of the psoas’ muscle fibers will pull on the surrounding fascia and have the ability to affect the kidneys and adrenal glands. Mechanical stimuli around the kidneys creates a change in the biochemistry of the local environment and can change the release patterns of adrenaline into the body. Changes in biochemistry can lead to adrenal fatigue and feelings of exhaustion, or overactivity in the adrenal glands, which results in the sensation of anxiety. The digestive system can also be affected by the psoas. Anatomically, the psoas dive s behind and then under the digestive system, creating a hammock that can act as a masseuse to the organs. With this in mind, an overly stretched psoas loses some of the connection to these organs when it becomes slackened and lengthened. Imagine the rubber band on a sling shot. When the band becomes overly stretched, it loses its ability to generate and exert much force on an object. While your organs are not experiencing the drastic forces generated by a sling shot, an overly-lengthened psoas loses the abili ty to provide a strong, massaging force to the organs inside the abdomen. 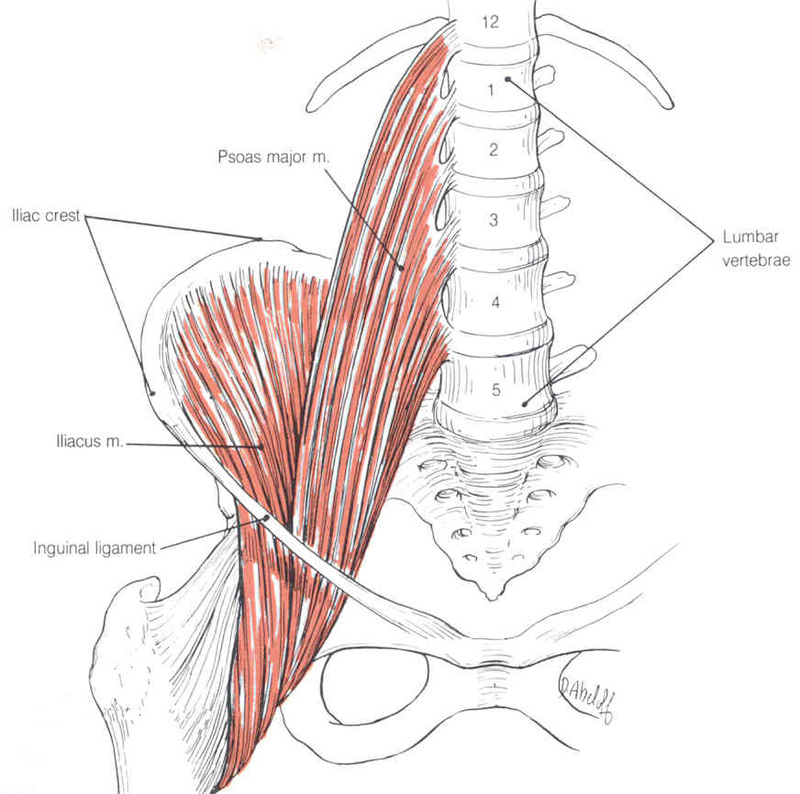 On the flip side, a psoas that is shortened and tight can generate too much pull on the organs of the abdomen. An overly active psoas will increase stimulation and neural activity inside the visceral cavity, igniting patterns that lead to tension in the organs. For this reason, the psoas is often referred to as the “fight or flight” muscle. When it is chronically tight and activated, it ignites the sympathetic nervous system, which shuts down digestion, increases adrenal activity, and prepares the body for action. While this was a useful action throughout evolution and when we need to prepare the body for quick action. Chronic activation of these sympathetic responses can lead to indigestion, anxiety, and fatigue. So how do we balance our psoas and avoid setting off a cascade of negative physiological events? While it may seem daunting to find the correct balance of strength and length in the psoas, many actions can help bring the psoas and its surrounding organs. into equilibrium. The first step is to bring awareness to the muscle. Using the tests discussed above, determine if your psoas is compressed or overstretched. Depending on the verdict, asana can be incorporated to either stretch (anjaneyasana, virabhadrasana 1, virabhadrasana 2, and any type of backbending) or strengthen (navasana, utthita hasta padangusthasana, dandasana, and parsvottanasana) the psoas. Incorporating a few of these postures into your morning and evening routine can quickly help restore the psoas and bring balance back to the inner ebb and flow of your other physiological systems.